Increasingly, walking is considered an essential form of exercise to reduce chronic disease risk, manage weight and support optimal health. Whether one walks for recreation, transportation or increased fitness, walking can be adjusted to suit individual needs, preferences, abilities and schedules. Walking is a simple, natural and inexpensive form of exercise. It requires no special skills nor equipment other than a pair of supportive footwear. The benefits of physical activity depend on intensity, duration and frequency. As such, the American Heart Association guidelines recommend that able-bodied adults participate in moderate intensity exercise, such as brisk walking, for a minimum of 30 minutes daily five days per week. Similar to other forms of moderate intensity exercise like swimming, cycling or dancing, walking not only improves a realm of cardiac risk factors, including vascular stiffness, obesity, inflammation and blood pressure; it also helps protect against dementia and depression. In addition to all the physical benefits of a daily walk, there are very real and immediate psychological effects as well. Research suggests that many underestimate the extent to which going for a walk positively benefits mood. Per the National Institutes of Health (NIH), there is evidence to suggest that exercise as a behavioral intervention has shown great promise in alleviating symptoms of depression. Research has also shown that those who are depressed are less physically fit, which in turn contributes to other physical health problems associated with sedentary behavior. An overwhelming majority of studies have confirmed the efficacy of exercise on improving mood and reducing symptoms of depression. Research also suggests that the benefits of exercise participation have long lasting effects. However, consistent moderate intensity exercise has proven to be most beneficial. Studies have shown that regular walkers who self-assessed their overall health reported that they had improved their diets, felt more energetic and highly rated their overall mood, happiness and self-esteem. Exercise improves mental health by reducing anxiety and negative mood and enhancing cognitive function and self-worth. A study by psychologists at Iowa State University found that even when the benefits typically associated with exercise research, such as fresh air, nature, social contact and the expectation of improved heath were disregarded, walking in and of itself proved to be a powerful mood lifter. The researchers argued that positive emotions are closely linked with movement, as humans evolved to move to find sustenance and other rewards. It appears that though many prefer to sit rather than move, we are happier when we are busy and active. Those who avoid exercise because they are not sure where to start should know that just getting out for a walk can make a meaningful difference in mental and physical health. When you’re feeling disengaged or sluggish, a brisk 10 minute walk can be energizing, uplifting and refreshing. It’s well established that aerobic exercise improves cardiovascular and cerebrovascular health. As a highly metabolic organ, the brain requires good blood flow to deliver necessary oxygen and nutrients. During exercise, blood vessels dilate allowing blood flow throughout the body to dramatically increase. Improved blood flow and reduced blood pressure are both associated with improved cognitive function. The effects of exercise are also linked to improved executive functions such as planning, thinking and judgment. While high intensity exercise releases feel good brain chemicals, there is value in lower intensity exercise sustained long term. Regular physical activity prompts the release of proteins known as neurotrophic or growth factors, which cause nerve cells to grow and form new connections. Nerve cell growth in the hippocampus, the region that regulates mood, helps to alleviate depression over time. Evidence-based health benefits of regular exercise include improved sleep, better endurance, stress relief, increased energy and stamina, weight reduction, and improved cardiovascular fitness, as well as mood enhancement and increased mental alertness. 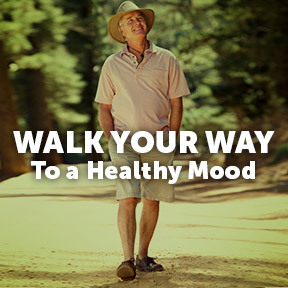 This entry was posted in Home and tagged walk, Walk Your Way to a Healthy Mood, Walking. Bookmark the permalink.